Kindly click on any of the topics below to read its content. There are thirteen defined types of Ehlers-Danlos Syndrome, as well as a number of mutations identified as Ehlers-Danlos Syndrome that fall outside the current system. The major types of Ehlers-Danlos Syndrome are classified according to the signs and symptoms that are manifested. Each type of Ehlers-Danlos Syndrome is a distinct disorder that “runs true” in a family. An individual with Vascular Type Ehlers-Danlos Syndrome will not have a child with Classical Type Ehlers-Danlos Syndrome. In the last decade, growing attention has been placed on joint hypermobility and related disorders. The new nosology for the Ehlers-Danlos syndromes (EDS), identifies 13 different types of EDS, and highlights the need for an updated and more reliable criteria. For the first time management and care guidelines have also been produced for the co-morbidities that can occur within EDS and HSDs. 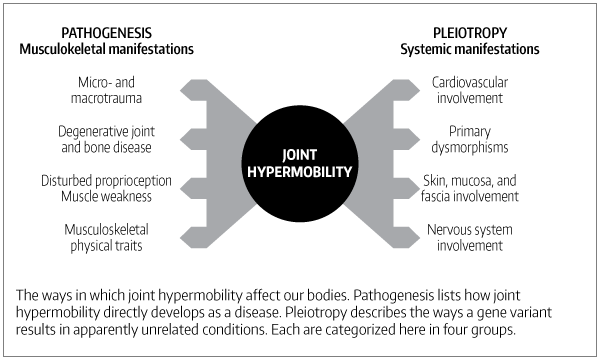 As part of this work, the terminology of joint hypermobility and related disorders is summarised and a group of hypermobility spectrum disorders is proposed. Please visit the the American Journal of Medical Genetics Part C: Seminars in Medical Genetics for the full supplement of papers. Cardiovascular autonomic dysfunction in Ehlers–Danlos syndrome—Hypermobile type (pages 168–174) Alan Hakim, Chris O’Callaghan, Inge De Wandele, Lauren Stiles, Alan Pocinki and Peter Rowe. Please note that this page is being updated as more information is made available to us. There are seven minor criteria. Minimal clinical standards suggesting clEDS are all three major criteria plus a family history compatible with autosomal recessive transmission. Please see the full criteria here [link coming soon]. A final diagnosis requires confirmation by molecular testing. 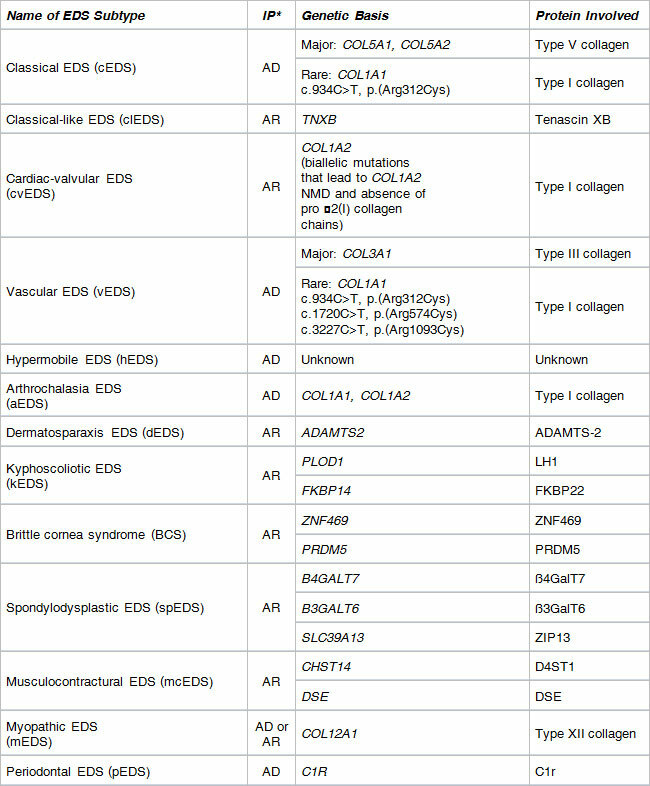 Patients with vEDS typically have a heterozygous mutation in the COL3A1 gene, with the rare exception of specific heterozygous arginine-to-cysteine substitution mutations in COL1A1 that are also associated with vascular fragility and mimic COL3A1-vEDS (see also “Ehlers-Danlos Syndrome, Rare Types” [link coming soon]). In very rare instances, biallelic pathogenic variants in COL3A1 may be identified. Vascular EDS is inherited in the autosomal dominant pattern. There is a clinical spectrum ranging from asymptomatic joint hypermobility, through “non-syndromic” hypermobility with secondary manifestations, to hEDS (see the page “Hypermobility Spectrum Disorders” [link coming soon] or “A Framework for the Classification of Joint Hypermobility and Related Conditions” by Castori et al. [link coming soon]). A final diagnosis requires molecular testing; pEDS is caused by heterozygous gain-of-function mutations in C1R or C1S. At present it cannot be stated whether absence of a C1R or C1S mutations excludes the diagnosis because the experience with the molecular diagnosis is limited. Periodontal EDS (pEDS) is inherited in the autosomal recessive pattern. *Note: Picture may indicate a degree of hypermobility not required by the diagnostic criteria. An important landmark was passed in July 2000 with the publication in the Journal of Rheumatology (2000; 27: 1777-1779) of the Brighton Diagnostic criteria for the Joint Hypermobility Syndrome (JHS). Diagnosis of an EDS subtype comes by finding the one that most matches the patient’s symptoms. There are clinical criteria [Link coming soon] that help guide diagnosis; your signs and symptoms will be matched up to the major and minor criteria to identify the subtype that is the most complete fit. There is substantial symptom overlap between the EDS subtypes and the other connective tissue disorders including HSD, as well as a lot of variability between them. So a definitive diagnosis for all the EDS subtypes—except for hypermobile EDS (hEDS)—also calls for confirmation by testing to identify the responsible variant for the gene affected in each subtype. These molecular testing results also provide the basis for genetic counseling for our families, guidance on treatment options for ourselves, and help in reaching research goals. The genetic basis for hypermobile EDS is still unknown. An hEDS (or HSD) diagnosis rests on the criteria [Link coming soon] physical examination, and quite often, a detailed family history. The 2017 hEDS criteria establishes serious consideration of joint hypermobility with all related symptoms and conditions, with hEDS at one end of the spectrum. HSD can be no less consequential than hEDS, either to your health or concern for treatment.